Thank you to Jacey for telling me about this and for Brent Riggs (if you have been praying for little Abby - she is on her make a wish trip right now if you want to check it out! )for inventing it.......I have a new post up on the prayer blog. If you have a prayer request - instead of e-mailing me - just go there and put it on the top post. Hopefully this will be more efficient. If you have sent me a request and don't see it on the list currently - then please go add it. THANK YOU!!!! So we proudly broke out our Razorback smocked dress today - along with our razorback bloomers, burp cloths, wipes holder and diaper bag! It was cold this morning so Harper wore her little red and zebra coat! I think I may have put this recipe on here before but I didn't have it on my recipe blog. 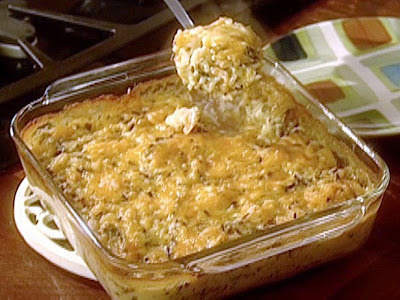 Last week I made Paula Deen's Wild Rice and Shrimp casserole and it was so good - another quick and easy cold weather meal! See the recipe HERE. I have seen this video several places lately and thought I needed to share it. In three short weeks - Scott and I are headed to El Salvador with Compassion International. I'm so excited/nervous. This video reminded me of why I am going. Compassion is an organization that finds sponsors for children to help them with food, clothing, school, etc. They change the lives of so many children. We sponsor a child in Nicarauga and will be sponsoring one in El Salvador that we will get to meet. In this video - a man who is in the U.S. from Kenya at Moody Bible College shares of how his life was changed when a 20 year old guy signed up to sponsor him. And then he met the man who changed his life. AMAZING! LOVE the victory gear! i had to switch away from the notre dame game to cheer on your hogs! i was sorry they lost! I love the red and black on Miss Harper! I can't get enough of baby girls wearing zebra print! I have read your blog since Harper was born, but never commented. However, I felt called to since your last post. My husband works for Catalyst and was THRILLED to see this video in your post. I was at the Catalyst conference (here in Atlanta) when that occurred, and it literally took your breath away. We also sponsor a child from Compassion (and are looking into actual adoption) and this is the root of why we do it. Thank you, thank you, thank you for posting this! 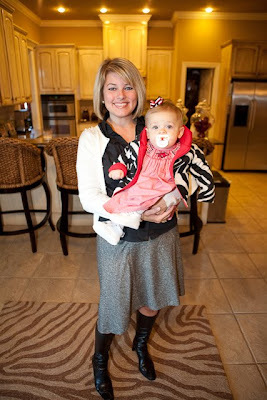 I LOVE reading your blog and look forward to dressing up my own sweet daughter some day! P.S...I bought the purple scarf from Walmart that you had on you blog a while back -- I love it! :) Thanks for inspiring me! All I can say is Go Hogs!!!! oh and one more thing.... I will be praying for you and Scott with your upcoming trip. I know it will bless your socks off but I also know from one Mommy to another how you will feel leaving that sweetie behind. Oh the Plans the Lord has!!! Those little hogs gave us Gators a big scare, but we kept the swine flu away! Miss Harper looks adorable in her Hogs gear! I also love her little red and zebra print coat! You look great as well! I posted the same video from Catalyst! It made me bawl!!! I can't wait to hear your stories from El Salvador. I'm so jealous!!! I would love to visit and meet our Compassion Child. You are going to have a blast!! Im so excited for you and your trip. I've sponsored a little girl for 7 years, Putri, from Indonesia and would love to visit her! LOVE the second picture of Harper! So precious. I sure was sorry to see the Hogs lose. We were cheering them on here! A Dawg can NEVER cheer for the gators. Harper's little victory dress is too precious! I've got to get my boys some winter Georgia wear. It has turned cold here too! Praying for you as you prepare to go! I wonder if you are going to the center where my Patricia is...it's CONFAD 778. I know you have a million things to do before you leave but if you think you are going to her center, I'd love to send you her name and picture and ask you to give her a special hug from me. My email is pecabo at gmail dot com. so cute. i am going to try that recipe it looks so good. Her smile is so adorable! I saw that video on Whitaker Woman's blog...such a blessing to just watch, I can't imagine being there!! LOL, love the pic of her smiling with those shoes on !! I have a pic of my little girl like that I her feet look HUGE too !!! OH, God bless you and Scott! I just know your trip to El Salvador will be so amazing for you and those you help. Awesome! I made the Paula Deen casserole you mentioned and it is fabulous!! I made her crock pot cobbler tonight. I love Paula! And your blog! harper is so adorable in all her hogs gear!! so sweet. you look great. do you know anything about actually adopting from El Salvador? I almost peed in my pants cause I was laughing so hard when I read what you said on your recipe blog. Corey will NOT eat anyhting that is a casserole...he hates them. I love your blog! Where did you get your outfit? I love the skirt and boots so much. Please tell me it is from Wal Mart so I can drive up there and get it today...ha! your very welcome Kelly! I hope it helps :)Great video by the way! Very inspiring. She is one precious and stylish baby girl! Love that coat. I must try this recipe soon. I just love anything Paula Deen. Yum! Oh- and good game yesterday! I kept checking your score during our Cyclone tailgate/game. So close! Momma and daughter looking so so cute!! That Harper is quite the fashionista! Love the zebra coat! Kelly, thankyou so much for the video post, I was a crying mess. My son's pre-school sponsers a child thru compassion. What a great story for me to share with him about how the money he earns and donates to this child will make a difference. You are so precious, and so is Harper!! You both look absolutely fabulous! Oh my goodness! I LOVE that little zebra coat! Where did you get it at? SO cute! Hey Kelly! I am trying to see the post on Show us what you make but have been unable to pull it up on your other blog....I know there are some super talented people who read your blog and I am so excited to do a little shopping! And to see where I can get my little girl some cute clothes like Harper! Thanks for allowing me to read your blog! Oh.my.goodness! That recipe sounds delish and I am such a fan of Paula Deen! I love her (but mostly her accent)! Hey! You both look so cute in your picture!!! I am so glad to get the shrimp casserole recipe...in all my 6 yrs. here I have never found affordable shrimp..until yesterday! Now I have a new recipe for it...now to figure out how to make wild rice from scratch...hmmm..
That is the cutest picture of Harper ever. Don't fall out, but I watched the game Saturday. I don't watch b/c I don't like to get upset. I thought this one was safe. Good grief! I got so mad at those refs! I had to go drown my sorrows in a huge amount of chips, salsa, cheese dip and guacamole when it was over. I think I'm over football now. Wishing I could squeeze some Harper! 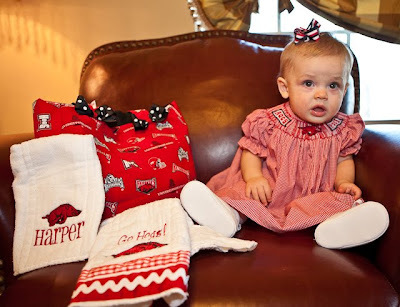 Harper looks adorable with all of her Razorback fashion accessories!!! She is a cutie!! Win or loose we have to sport our team colors!!! Hope you all have a great week. I can not watch all of the video in one setting, it just put me on the floor, tears in eyes even as I write this. I am praying for your up coming trip. I fell in love with India when the Keely took us all on a rick-saw ride. I was unable to find a child to sponsor, and instead chose to sponsor a Child Survival Program there in India. So, if you do not think you can find a child to sponsor, please please look into CSP. Your 20 dollars a month can make the difference. The death rate for infants in India is currently 40%. God is good. Sorry your hogs got beat I was at a birthday party and it was front and center on the big screen. All party activites were planned around the game. Where oh where did you get that zebra coat??? LOVE it! Wow..what a wonderful video! It has so inspired me to sponsor a child. I will looking into it more today. Yummy recipe...I make one very similar with tuna or chicken, but never thought of shrimp for a great change. You guys are so cute! I am so excited for your Compassion trip! I was at Catalyst for the compassion moment and it was one of the most powerful expressions of Jesus Christ that I have ever seen lived out between two people. Thx for posting. That smile is contagious! I love it!! Every time I see Harper smile, it makes me smile. She's such a joy! Isn't having a girl just so much fun? I love mine to pieces. I have a special place in my heart for El Salvador -- I went on a missions trip there with a group called Shake the Nations in 2001, just a month or so after I graduated high school. It was a life-changing trip, so it always bring joy to my heart to hear people are still going there to change their worlds. WHere or where did you get that coat for Harper?? So cute!! Was at Catalyst and saw this moment live. I am telling you, not a dry eye in the whole place. Something I will never forget! KELLY! You know I'm a Bama girl. But everyone who follows SEC football (aside from Gator fans) knows how badly the refs blew the "personal foul" call during Florida's game winning drive. THEY SUSPENDED THE REFS WHO CALLED THAT GAME!! Not that it changes the final score.... :( But atleast they are doing something! These SEC refs are making calls that are changing the outcome of games....thus affecting the national rankings! Think about it? If they don't call "excessive celebration" on Georgia, against LSU then it's unlikely LSU scores and wins. That keeps them out of Nat'l Champ race. If they don't penalize Arkansas TWICE on Florida's final drive, perhaps FL doesn't score, dropping them out of the #1 spot.